Why hassle with trying to find a parking space when you can be eating chili and groovin’ to the tunes this Saturday? If you are one of the 70,000 people anticipated to attend the fair, and if you are driving, you can park at two locations, take a trolley and leave the hassles to Larry, Curley and Bob. And it’s FREE! 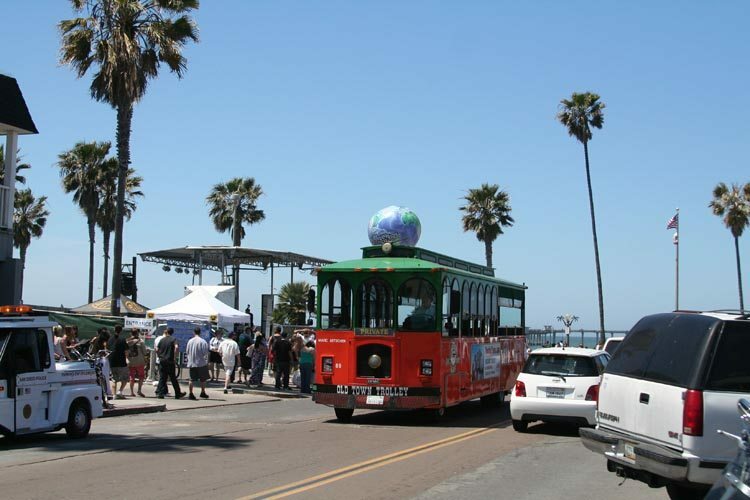 *The trolleys will run from 9:30 am to 9:00 pm on Saturday. *One trolley will leave from Rob Field- an estimated 10 minute trip each way. *Two trolleys will leave from the large open area on the SW corner of Hwy 5 and Sea World Drive –estimated time 20 minutes each way. An estimated 1,800 very smart fair goers used the trolley last year and there is room for more this year. We are told that the trolley drivers are quite entertaining. I’ll be riding the trolleys and interviewing fair goers and will provide a full report, oddly rendered. The trolley is underwritten by Cox Cable. This is their third year. Thanks Cox Cable! Thanks Anna, this is great info to pass along to my out of town guests. As much as the OBMA would like to take credit for the underwriting of the trolley’s it’s only right the credit goes where credit is due. The Trolleys get expensive and Cox Communications has stepped up to the plate for the last three years. Cox has been a pleasure to work with and anyone who has used the trolleys in the past will appreciate their sponsorship. How’s the water and waves today, anybody?